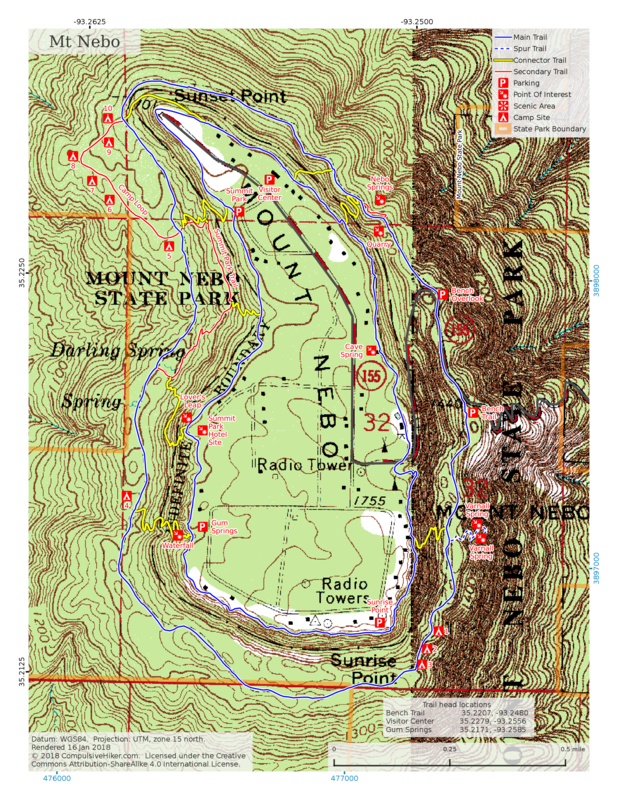 Located a few miles southwest of Russellville and rising about 1300′ above its surroundings, Mount Nebo State Park is not a big one but does offer some pretty nice scenery, great vistas, good day hiking, and a place to (legally) launch a hang glider if you’re into that. The visitor center is at 35.227758,-93.25606. The main attractions (for a hiker) are the 3.25-mile Rim and 3.75-mile Bench trails. May ’13 sightseeing, July ’14 hikes. The Rim Trail is the star of the show, encircling the top of the mountain as it winds up and down through a bluff. Scenic vistas abound, as does CCC handiwork. The trail has some very easy parts and some surprisingly challenging parts. The Bench Trail is an old road that circles the mountain, mostly on a natural bench about 200′ below the rim. With probably no more than 30-40′ of elevation change in its length it’s a pretty easy hike and is popular with runners and bikers. There are 10 walk-in camp sites along this trail (permit required). A short road walk is needed between the Bench Overlook and the Bench Trail parking areas. The area is thickly wooded and I think the only scenic vistas are the Bench Overlook and a power line cut a bit west of there. There are also 7 connector trails that run between the Rim and Bench trails, most built long ago for access to springs. These trails are steep and can really add some challenge to the hike. I like to park at the Bench trail lot and do 2 laps around the mountain, taking each connector as I come to it, alternating between the Bench and Rim Trails. The base map for the Dardanelle quad (the eastern 1/3 of this map) has 20′ contour lines, which turn the steep terrain here into a big brown blob. Sorry! Click on an image to get it full-size for download. The map will print at 1:10000 scale on 8.5×11 paper. Every time I update the map the image will have a different name so if you want to bookmark or share the map, link to this page – not the image.